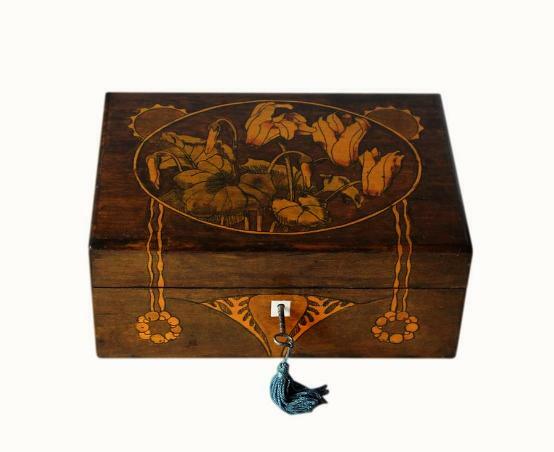 This is a fabulous antique jewellery box with stunning hand painted floral decoration. 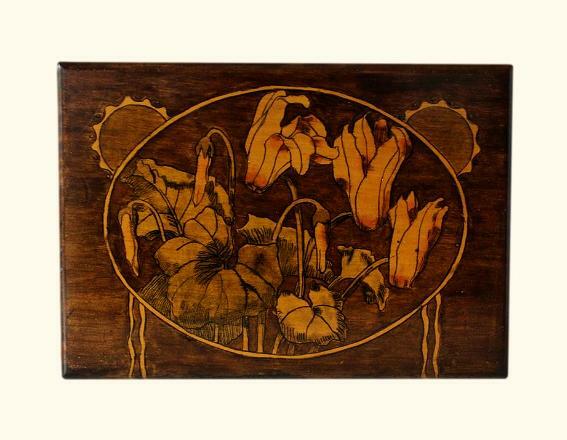 It was made during the Art Nouveau period and dates to 1890/1900. The interior has been beautifully refurbished by our skilled box restorer. The exterior has a lovely dark stained finish and absolutely beautiful hand painted organic subjects. 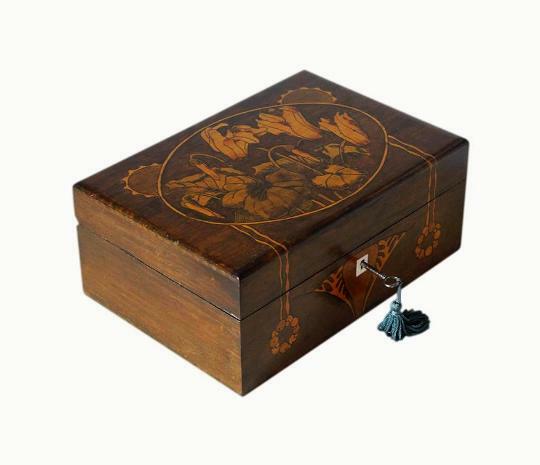 There is a large hand painted scene on the lid featuring budding Lilies and Water Lily leaves. These are surrounded by a lovely painted oval frame. There are also beautiful painted Suns above the frame. 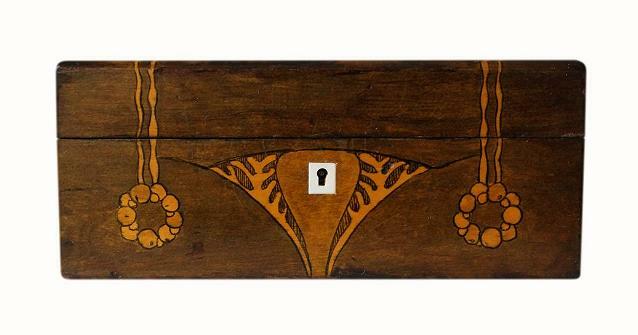 To the front of the box, surrounding the keyhole, is a beautiful large painting of the inside of a seed pod. Also to the front are lovely painted berry garlands, hanging from pretty ribbons which extend from the lid. Our skilled box restorer has added a new bone escutcheon to the keyhole. This is beautifully inset flush against the wood. The box is complete with its original working brass lock. This has a replacement period key which locks the box securely. The box also has its original brass 'stop' hinges which hold the lid upright. 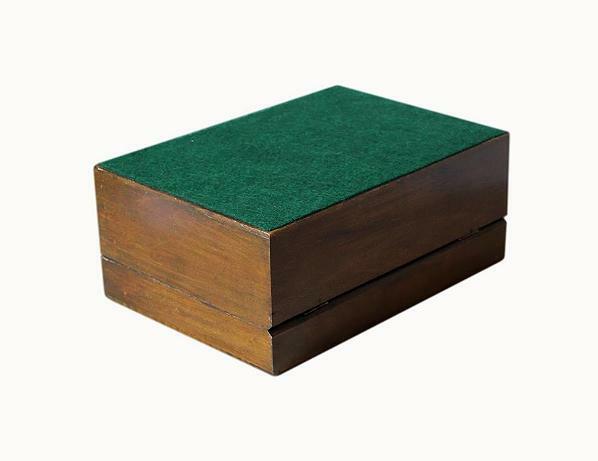 The bottom of the box has a new soft felt lining which will protect the surfaces of furniture. The interior has a single storage compartment which has been beautifully refurbished by our skilled box restorer. 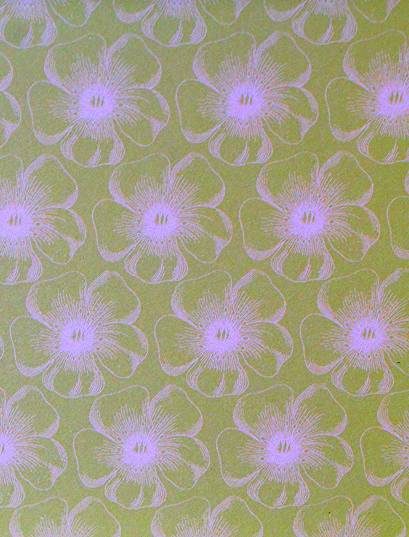 There is a new padded sage green satin panel in the base, and new sage green satin linings to the walls. The compartment is fairly large and spacious. 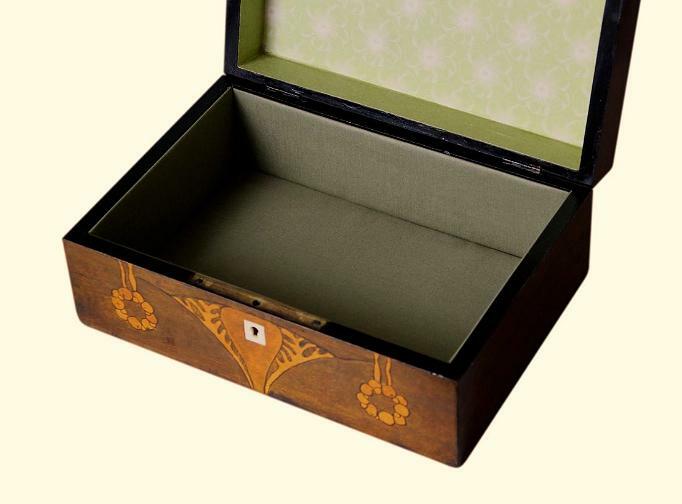 It is deep enough to store large pieces of jewellery such as watches, wide bangles and beads. The inside of the lid has beautiful new quality paper linings. That to the centre is a patterned pale green paper with beautiful white Poppy motifs. You can read about Jim, our wonderful skilled box restorer, by visiting our About Us page. 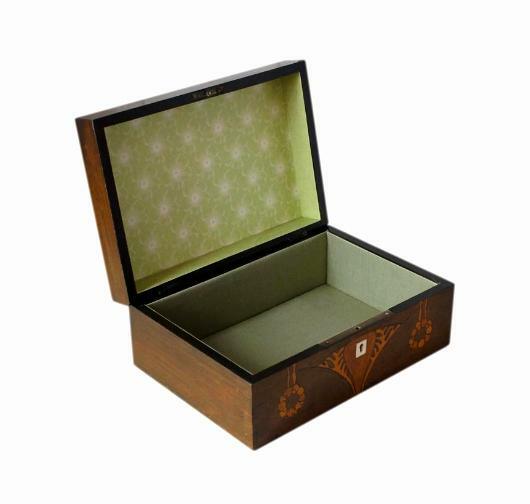 This wonderful box is in excellent condition with only minor light age related wear. The beautiful painted decoration is still colourful and has no loss. The interior linings, and felt lining to the bottom, are in superb unused condition, being new. The hinges and lock are in good working order and the box is of sound structure. We would like to make you aware that antique locks can occasionally malfunction. They are already very old and will naturally have some wear from age and use. We are not responsible for locks that may malfunction from further age and use once boxes are purchased. Locks are checked, prior to posting, but please ensure the lock is still working as soon as you receive the box. 21.7 by 14.3cm with a 5.9cm depth. International postage is £25. Delivery is fast, within 3-5 working days to Europe and 5-7 working days to the rest of the world. Delivery is by Royal Mail International Tracked and/or Signed For postage.